The compact and select resort of San Agustin is located in the south east corner of Gran Canaria and 18 miles south of the island's airport. Set just along the coast from the bustling resorts of Playa del Ingles and Maspalomas, the resort attracts couples and families looking for a quieter location yet within easy reach of the beaches and lively nightlife of Playa del Ingles. San Agustin is lined by an attractive pedestrianised promenade that runs down to Playa del Ingles; this attractive walkway runs parallel with several popular broad dark sandy beaches that are well equipped with sun loungers and parasols. The resort has a small commercial centre and several shops that sell souvenirs and beach accessories. During the day most visitors spend their time on the beach or by the pool, in the wider resort area there are plenty of diversions including, golf, horse riding, tennis, mountain-bike tours, amusement park, water park, roller-skating; various water sports, such as windsurfing, diving (a couple of schools) and deep-sea fishing. 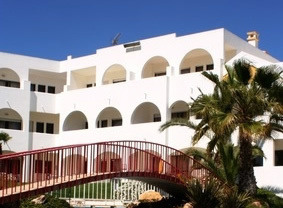 In the evenings the resort is quite low key, there are several bars and restaurants but with the variety of choice available a short taxi ride away, many visitors head down to Playa del Ingles. Most of the hotels have an entertainment programme with live shows and nightclubs and for those that enjoy a flutter the resorts Casinos are open until the small hours. Tours and excursions could include island tours by tour bus, jeep or hired car. Various theme parks include Sioux City (Wild West theme park), Aqua Sur Water Park, Camel Safari park, Palmitos animal and Crocodile Park. Las Palmas, a sizable city and port, offers the best shopping opportunities and has some good duty-free bargains.